Viski J, his digital signature. J Viski,Janos Viski. JANOS VISKI was born in 1891, in Szokolya, Hungary. This brilliant Hungarian artist studied at the Academy of Fine Arts under Tividar Zempleny directions. 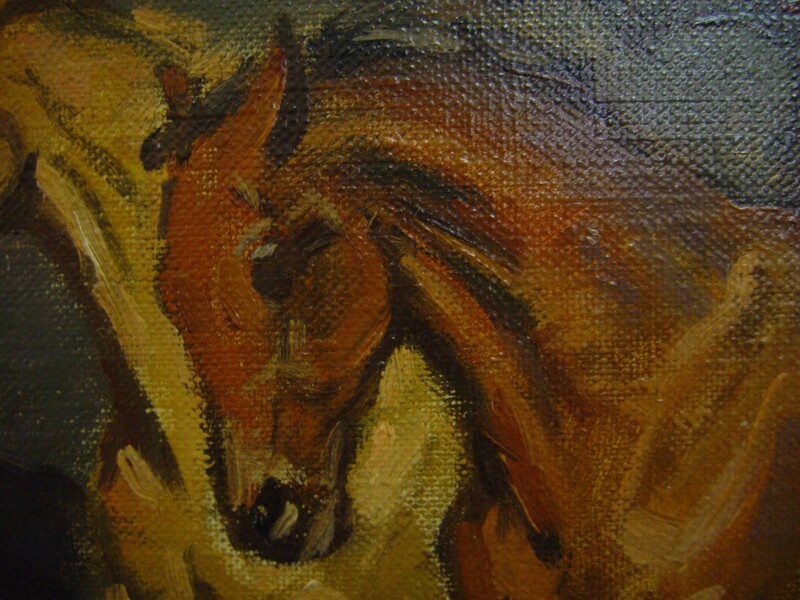 His first exhibition dates from 1913 -although there is some people date it from 1921- By admiring his works, one can easily see-through his paintbrushes, and feel his passion for animals, specially horses. According to many Art Specialists, it was not just the animal he was interested in but also it's features and particular movement, which he successfully managed to portray in his works. Forms and colors were his main tools to express himself, animals and landscapes, his passions. His works reflect that supreme blend, fantastically achieved by a gifted artist. 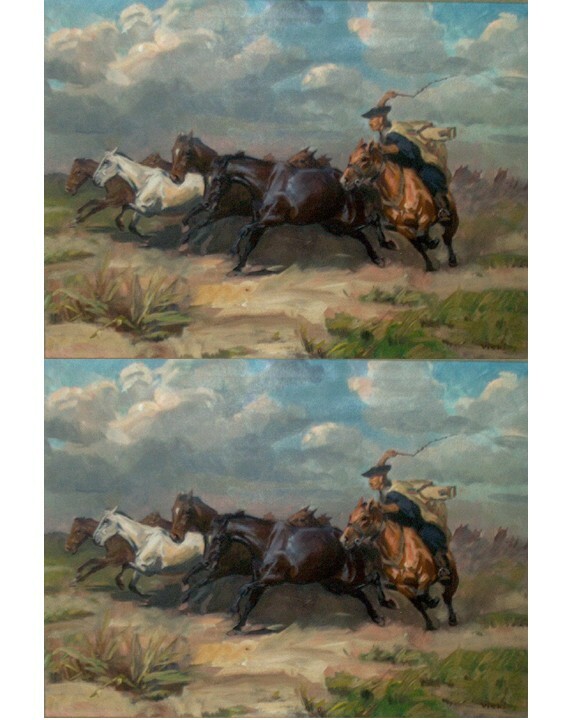 Featuring motion and forms as well as color effects in open-air locations, his most frequent model were horses. His pictures express strength; and a careful admirer would discover a great impressionist effect. His paintings could and can be admired several museums, galleries and show rooms all over Hungary, and many of them can be found in private collections in Brazil, Uruguay and Argentina. For in his quest to admire light and natural beauty, he traveled several times to these southern countries on study trips. In 1936 he was awarded a Grand Prix at the 1936 Salon des Beaux Arts in Paris. Email Bob Frassinetti. The Buenos Aires Art Dealer,Argentina. Bob Frassinetti. Copyright 2005. Roberto Dario Frassinetti. Record Price (Jean Viski) 03/31/93 For more information: Email: admin@frassinetti.com Bob Frassinetti. Press here to go back to web blog:Daily Updates on Art, Antiques, Collectibles as well as travel information for Buenos Aires, Argentina. Phone me thru Skype, ID: Bob Frassinetti or you can also chat with me thru Yahoo, press here: Yahoo Contact Find me on MySpace and be my friend! 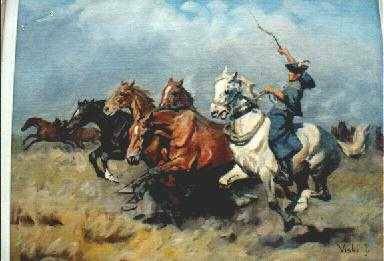 Jean Viski is best known For: 1891 - 1961,rural landscape, horse, western cowboy, cattle. Email Bob Frassinetti. The Buenos Aires Art Dealer,Argentina. Bob Frassinetti. Copyright 2005. Roberto Dario Frassinetti. are these viski paintings for sale? Would you please advise whether this painting is still for sale and the price? Also, is there a catalogue of Viski paintings? We have several Viski J. paintings brought over from Hungary early in the 1900s. They are intensely beautiful, with horses galloping on the plains similar to above, but coming more at the viewer, as well as runaway horses pulling a cart, etc. Will not sell, but interested to know how much they're worth, and to know if anyone else nearby has any. We are in North Carolina and Michigan. Of all our collection of Hungarian art, the Viski are my favorites. J Viski,Janos Viski. JANOS VISKI was born in 1891, in Szokolya, Hungary. J Viski Sporting Painting for sale. For more information contact me, Email: Bob Frassinetti. Press here to go back to web blo:Art Dealer & Journalist. 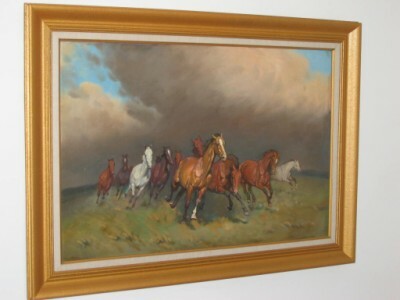 It is about 50 x 70 cm: signed VISKI J with a herding of horses and 1 cowboy.This oil painting is in The Netherlands Email me for more information if you are interested in buying this painting: So if you are interested in Art or Antiques, and you are travelling to Argentina please feel free to email us…….. and what about Collectibles and just to mention some like Advertising, Advertising Art, Architectural, Art Deco, Auto Parts, Badges, Banks, Beswick, Bottle, Bottle Openers, Bronze, Button, Calendars, Candy Containers, Carnival Glass, Chandeliers, Christmas, Coca Cola, Corkscrews, Elvis Presley, Ethnic Art, Ethnic Toys, Fans, Fishing, Fishing Reels, Folk Art, Francisco Adaro, Furniture, Lamps and lightning items, the wild 60's and 70's, Garden Furnishing, Girl Scout, Glass Art, Glass Contemporary, Golf, Halloween, Inkwells, Insulators, Ivory, Japanese Woodblock Prints, Jewellery, Judaic, Kitchen, Knife, Lamps, Lighters, Lightning Rod , Majolica, Match Holders, Medical, Motorcycles, Music, Napkin Rings, Nautical, Netsuke’s, Nutcrackers, Paintings, Liberato Spisso, born Buenos Aires, Argentina. 14 March 1903, Portrait Artist, Viski, Jean ( Janos ) 1891 - 1961, Old Car, Paper, Paperweights, Pens, Pencils, Pencil Sharpeners, Pepsi Cola, Perfume Bottles, Pewter, Phonographs, Photography, Postcards, Posters, Prints, Radio, Railroad , Records, Steam Tractor, Scientific Instruments, Sewing, Sheet Music, Silver, Souvenirs, Sports, Stero Cards, Stereoscopes, Telephones, Television, Tools, Toys, "The Buenos Aires Toy Museum. Argentina", or a Tractor, Typewriters, Watch, Weapons, Weather Vanes, Wood Carvings, Wooden, World's Fair, to say Vito Campanella. For more information: Email: Bob Frassinetti. Press here to go back to web blog:Daily Updates on Art, Antiques, Collectibles as well as travel information for Buenos Aires, Argentina. Phone me thru Skype, ID: Bob Frassinetti or you can also chat with me thru Yahoo, press here: Yahoo Contact Find me on MySpace and be my friend! J Viski,Janos Viski. JANOS VISKI was born in 1891, in Szokolya, Hungary. This brilliant Hungarian artist studied at the Academy of Fine Arts under Tividar Zempleny directions. His first exhibition dates from 1913 -although there is some people date it from 1921- By admiring his works, one can easily see-through his paintbrushes, and feel his passion for animals, specially horses. According to many Art Specialists, it was not just the animal he was interested in but also it's features and particular movement, which he successfully managed to portray in his works. Forms and colors were his main tools to express himself, animals and landscapes, his passions. His works reflect that supreme blend, fantastically achieved by a gifted artist. 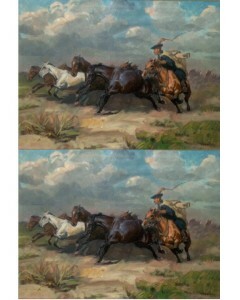 Featuring motion and forms as well as color effects in open-air locations, his most frequent model were horses. His pictures express strength; and a careful admirer would discover a great impressionist effect. His paintings could and can be admired several museums, galleries and show rooms all over Hungary, and many of them can be found in private collections in Brazil, Uruguay and Argentina. For in his quest to admire light and natural beauty, he traveled several times to these southern countries on study trips. In 1936 he was awarded a Grand Prix at the 1936 Salon des Beaux Arts in Paris. Email: Bob Frassinetti. Art Dealer & Journalist. Brilliant Hungarian artist studied at the Academy of Fine Arts under Tividar Zempleny directions. His first exhibition dates from 1913. So if you are interested in Art or Antiques, and you are travelling to Argentina please feel free to email us…….. and what about Collectibles and just to mention some like Advertising, Advertising Art, Architectural, Art Deco, Auto Parts, Badges, Banks, Beswick, Bottle, Bottle Openers, Bronze, Button, Calendars, Candy Containers, Carnival Glass, Chandeliers, Christmas, Coca Cola, Corkscrews, Elvis Presley, Ethnic Art, Ethnic Toys, Fans, Fishing, Fishing Reels, Folk Art, Francisco Adaro, Furniture, Lamps and lightning items, the wild 60's and 70's, Garden Furnishing, Girl Scout, Glass Art, Glass Contemporary, Golf, Halloween, Inkwells, Insulators, Ivory, Japanese Woodblock Prints, Jewellery, Judaic, Kitchen, Knife, Lamps, Lighters, Lightning Rod , Majolica, Match Holders, Medical, Motorcycles, Music, Napkin Rings, Nautical, Netsuke’s, Nutcrackers, Paintings, Liberato Spisso, born Buenos Aires, Argentina. 14 March 1903, Portrait Artist, Viski, Jean ( Janos ) 1891 - 1961, Old Car, Paper, Paperweights, Pens, Pencils, Pencil Sharpeners, Pepsi Cola, Perfume Bottles, Pewter, Phonographs, Photography, Postcards, Posters, Prints, Radio, Railroad , Records, Steam Tractor, Scientific Instruments, Sewing, Sheet Music, Silver, Souvenirs, Sports, Stero Cards, Stereoscopes, Telephones, Television, Tools, Toys, "The Buenos Aires Toy Museum. Argentina", or a Tractor, Typewriters, Watch, Weapons, Weather Vanes, Wood Carvings, Wooden, World's Fair, to say Vito Campanella. For more information: Email: Bob Frassinetti. Press here to go back to web blog:Daily Updates on Art, Antiques, Collectibles as well as travel information for Buenos Aires, Argentina. Phone me thru Skype, ID: Bob Frassinetti or you can also chat with me thru Yahoo, press here: Yahoo Contact Find me on MySpace and be my friend! I own a Viski J original Oil on canvas; a group on horses huddled on the pampass with strom clouds overhead. Have been attempting to find out about it and its' worth for years and years. I have owned it for more than 20 yrs. and my sister before me for who knows how long. Can you possibly shed some light on it??? A reply would certainly be appreciated. Press here to SEE another Photo Gallery of mine on Viski, Viski, Janos Viski. JANOS. Our Art specialists research group has developed new and interesting projects regarding the famous Hungarian artist Janos Viski. Our first approaches led us to believe that Viski was a country side, horse lover. Most his works exhibited those images in many cases featuring at the same time a very interesting Argentine gaucho feel. His works were mainly on canvass and the main technique was oil painting. However, we have recently found a broader use of techniques and styles, from engravings to drawings. We also found trace of other countryside scenes that feature other farm animals other that horses. The fact that the top notch quality and the same paintbrushes can be told out of these works, the fact that his signature is original in all these other versions, has led us to inquire a bit more about this fabulous artist. We?ll soon be posting new information and articles on the matter. At the same time we would like to welcome readers and experts from around the globe to take part in this recovery project on Janos Viski. Interested in buying art, antiques or collectibles from Buenos Aires or for that matter any other item that I have mentioned in any article you have found on this my web site, you can buy Toys from me from my toy museum and thru eBay,press here; Toy Museum on eBay and thru The Buenos Aires Art & Antique Dealer, press here; Art Dealer on eBay From Art to Antiques. Or contact me direct. For more information :Email Bob Frassinetti. Press here to go to The Buenos Aires Art Dealer is a webzine magazine on Art, Antiques & Collectibles made or found in Argentina. The Buenos Aires ArtDealer, Argentina. We have news for our friends around the globe. Thanks to the latest technology inputs, we can now chat in real time in an over the phone like system thru Skype. This is a new asset to make our communication easier, faster and more personal. Please feel free to reach me at any time just connecting to ?Bob Frassinetti?. Remember all the same that we still have Msn, Yahoo, email, video and regular phone conferences to communicate!